For 28 years you couldn’t leave or return to Belvedere or Tiburon without passing a swaybacked horse named Blackie standing in a field that became known as Blackie's Pasture. 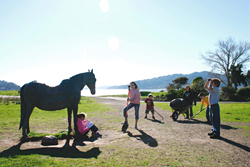 Today, thanks to a wonderful gift by the family of Gordon Strawbridge, Tiburon's first mayor, a life-size bronze sculpture of Blackie stands in the pasture, visible to all who drive by. Created by the noted Bay Area artist, Albert Guibara, it was erected in June 1995 thanks to the Tiburon Peninsula Foundation. It’s a reminder of Tiburon's past, a link with earlier times, and a cherished memory older residents share with newcomers. Blackie was a cavalry horse in his youth, having been stabled at the Presidio. In spring the cavalry would saddle up their horses, ride to Yosemite National Park, and patrol the park all summer. When winter arrived they returned to the Presidio. After being retired from the Army, Blackie became a cutting horse at rodeos, and when he was 12 years old was retired to a private pasture at the corner of Tiburon Boulevard and Trestle Glen Road—what’s now known as Blackie’s Pasture. His owner, Anthony Connell, visited him daily, as did children and adults alike who could be seen feeding Blackie carrots, sugar, and hay at all times of the day. To those who lived in the area, Blackie was Tiburon’s horse, a friendly steed who belonged to everyone. In spite of his age and swaybacked condition, many people felt he still exhibited a military air and pride that came from having been a great horse in his early years. Born in Los Angeles in 1944, Albert Guibara spent most of his adult working life in the San Francisco Bay Area. 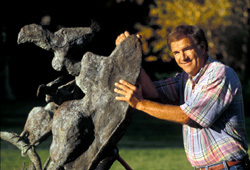 He began sculpting at the age of 24 and, from the start, his subject matter was as diverse as one could possibly imagine. Restless with simply repeating a single image in the same way, he has consistently stretched his talent into uncharted areas of creation to produce a body of work that effectively defines his artistic versatility. Albert Guibara lives in Burlingame, California, with his wife and three children. You can learn more about the artist here.